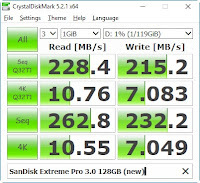 RMPrepUSB, Easy2Boot and USB booting: Which is best, the SanDisk Extreme Pro or the cheaper SanDisk Extreme (you may be surprised!)? Which is best, the SanDisk Extreme Pro or the cheaper SanDisk Extreme (you may be surprised!)? Hurray! My new SanDisk Extreme Pro USB 3.0 128GB flash drive just came this morning. 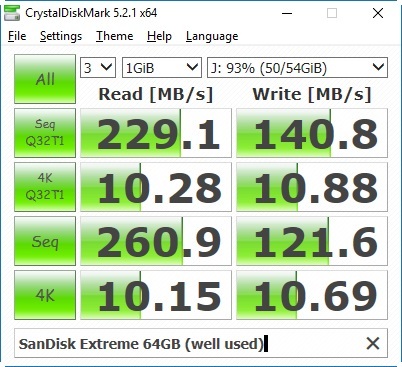 I have now run a few tests on it and compared it directly with the SanDisk Extreme USB 3.0 64GB flash drive. I tested the Pro using Crystal DiskMark and then filled to entire drive with junk data and then repeated the test. This ensured that the flash controller had to perform a read-erase-write cycle on every write when running any further tests. However, there was no difference between benchmarks after I had filled it with junk data and then re-formatted it. This indicates that the USB controller always does a read-erase-write cycle on every write (so not an SSD controller). The results were similar (but they did vary a fair bit when repeated). I extracted the 1000's of small files from a XP Pro SP3 ISO onto each drive using 7Zip. I booted each flash drive to E2B on an IdeaPad 300 and a USB 3.0 port. The SanDisk Extreme 64GB was noticeably faster (probably twice as fast, though I did not time it because they did not have identical contents). Extreme 64GB: 14 secs << FASTER! When booting to WinPE from an ISO, I noticed little difference (14 seconds for each). When booting to a full Windows 10 .VHD file, the Pro was approx. 1 second faster (15\16 seconds). Inateck FE2007 USB 3 enclosure + Samsung 500GB 850 EVO in Green for comparison. Note that the Random Access time and non-repetitive sequential xfer rates for the cheaper Extreme are better than the Pro! Under Windows, the Extreme Pro is certainly faster, both for large files and small files. However, under grub4dos, BIOS access is much slower than the cheaper SanDisk Extreme. However, if you use E2B a lot and need to boot to the E2B menus as quickly as possible to run diagnostic software, etc., I would recommend the cheaper SanDisk Extreme. If you regularly copy lots of different files to your E2B drive under Windows (e.g. large VHDs or ISOs) the Extreme Pro will certainly take less time to copy them over than with the SanDisk Extreme. Running WindowsToGo will also be faster, as should full linux installations or linux+persistence. If booting from an E2B USB drive using Virtual Box, the Pro should be faster too. 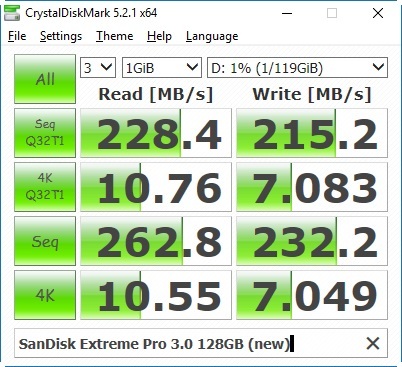 Note: In this blog post, I have compared a SanDisk Extreme 64GB drive with a SanDisk Extreme 128GB Pro drive. The SanDisk Extreme 128GB may show slightly different timings to the SanDisk Extreme 64GB. P.S. The drive shell casing of the Extreme Pro was slightly larger than the Extreme and was half-metal. Personally, I did not feel it to be of particularly good quality, or very attractive or very tactile - so the metal case was not really a plus-point for me. See also: my previous blog post on the Lexar P20 and why you shouldn't buy it! Please tick a Reactions box if you enjoyed this post.